In the winter of 1990 while doing some work in the Peace Forest just below the Haas promenade (in Hebrew known as the tayelet) workers discovered a burial cave made up of 4 recesses (called loculi), rectangular spaces about 6 feet deep and 1.5 feet wide, cut in the limestone bedrock. The promenade, a dream of Teddy Kollek and designed by the Israeli landscape architect, Shlomo Aronson, is built on the ridge with an impressive view of the Old City walls and ancient city of David; I often take people there to begin a tour. Since many tombs have been found in the Kidron and Ben Hinnom valleys around the Old City it was not a surprise to find this burial cave. Inside were found 12 ossuaries, 6 scattered about indicating that the cave had been robbed in antiquity but 6 in their original places. Zvi Greenhut, the IAA archaeologist called to the site, identified it as a Jewish burial cave from the Second Temple period. At this time, burial for those who could afford a family tomb, the body was laid out in a recess carved in the wall of the cave and closed off. A year later, after the flesh had decomposed, the family returned, opened the loculus and gathered up the bones and deposited them in a cavern with earlier bones. That’s the explanation of the expression in the Bible “to be gathered up with his forefathers” and why it is a custom to revisit the grave after a year. Later it became customary to put the bones in a special limestone box and to write the name of the deceased on the outside – this coincided with the rise in belief of a physical resurrection at the End of Days. Of the five ossuaries with inscriptions we find the names of two women: Miryam berat Shimon and Shlom… the full version would be Shlomzion. From the name written on two of the ossuaries the cave seems to be the family tomb of Qafa, in Greek Caiaphas, a name known to us from the New Testament and writings of Josephus, one of whom was the high priest who presided at the trial of Jesus. One of these ossuaries is decorated beautifully in a rare and intricate pattern of two circles, each made up of six whorl rosettes, bordered by a pattern of palm branches. Inside were found bones from six different people, two infants, a child between 2 and 5, a young boy between 13 and 18, an adult woman and a male of about 60. On the undecorated end is inscribed “Joseph bar Caiaphas” not necessarily “the son of” – here Caiaphas is a nickname which became a sort of family name. A fascinating statistic from the Second Temple period based on personal names mentioned in literary sources and inscriptions is that 28% of men had one of 4 names (Joseph and Shimon being the two most popular), 9 names account for 44% of men (so a family nickname would help identify people); for women it was even more extreme, 50% of women had 2 names, Miryam, which later became Mary and Shlomzion the equivalent of Salome in Greek. A coin found in one of the ossuaries was minted by Herod Agrippa (37–44 C.E.). This would help us date the two Caiaphas ossuaries perhaps as early as the beginning of the century. The evidence suggests that we may have recovered the burial box (ossuary) and even the bones of the high priest Caiaphas who handed Jesus over to the Romans. 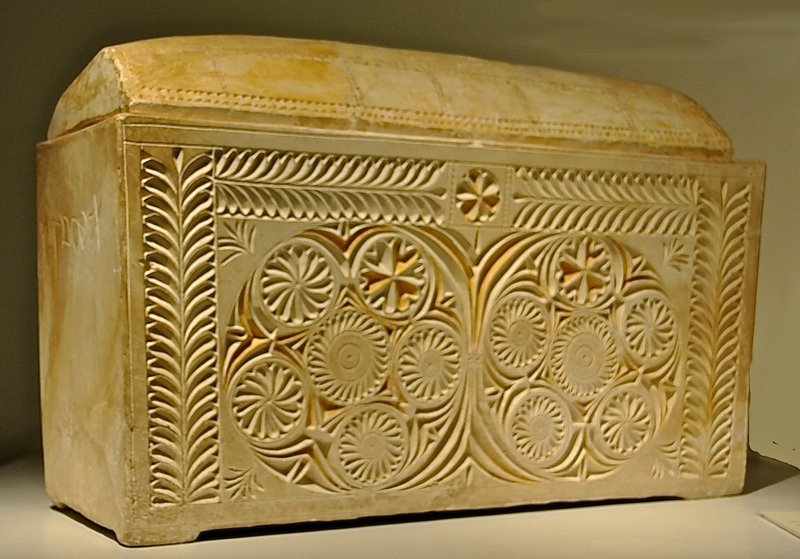 This entry was posted in Archaeology, Tomb and tagged burial cave, family tomb, Herod Agrippa, loculus, ossuary, promenade, tayelet, Tomb on December 14, 2010 by Shmuel Browns. As usual, an interesting/informative post! But “to be gathered up with his forefathers” actually goes back to the Hebrew Bible (Judg 2:10; 2 Kings 22:20; 2 Chron 34:28). Originally it probably pointed to the “repository” in Judean Tombs from the 8th century BCE—but the expression was probably still in use in the Second Temple Period as you suggest. Thanks for the clarification, Carl and the link to 1st Temple period tombs. Yes, the archaeology helps us to understand the Biblical text.